Khasta kachoris a delicious, spicy and fried round puff pastry stuffed with split urad or moong dal and aromatic Indian spice, it is the most famous street food in India. If khasta kachori makes with dry masala dal have a longer shelf-life. 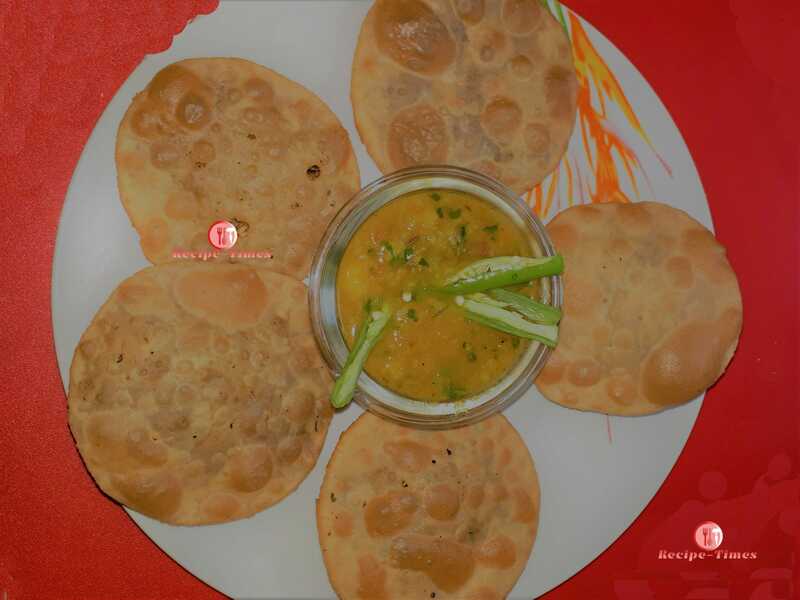 Kachoris are great as an appetizer or as part of a festive meal for any occasion. Mix the flour, salt, and ghee with fingers in a deep bowl, add cool water slowly, mix ing finger as you pour. Do not knead too much dough, the dough should be soft.Cover the dough with damp cloths and let it sit for thirty minutes. Heat the oil in a nonstick pan, add asafetida saute one second, add moong dal and saute2-3 minutes on a medium flame. Add the ginger chili paste and all spices and salt, sprinkle little water, mix very well.cover with a lid and cook on a medium flame for 4-6 minutes, stirring occasionally, turn off flame. Add besan, amchur,kasoori methi and mix well, divide the filling into equal portion and keep aside for cool. Take the dough and divide into equal portion, take one part of the dough and with your finger flatten the edges and make into three inch circle. Center should be little thicker than edges. Place one tsp filling in the center, pull the edges of the dough to wrap the filling. Proceed to make all kachoris, filled ball sit 5-6 minutes before rolling. Heat the oil in a deep non-stick pan or kadhai and deep fry,3-4 kachoris at a time on medium flame, kachoris should sizzle and come up very slowly. Fry them on medium flame. After the start puff, slowly turn them, fry golden brown on both sides. Remove and drain on an absorbent or kitchen towel paper. kachoris can be stored for a week in an airtight container. Khasta kachoris relished with hot tea in the morning or in the evening. Serve in breakfast, lunch or dinner with potato curry. Kachori chat also prepares with beaten curd, fresh coriander chutney, tamarind chutney with small sev.